Our Savior’s Lutheran Church is older than the community it calls home. 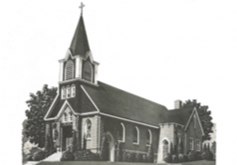 When the parish began, in 1867, Hartland wouldn’t be incorporated for another 25 years. It really is part of the history of Hartland. The church, originally called St. Martin’s, had its first meeting May 5, 1867. Congregation members met in a church on a hill at 400 Capitol Drive, across from what is now the Hartland Village Cemetery. The church changed its name to Our Savior’s Lutheran Church in 1935, and moved to a new location — at the southeast corner of North Avenue and Highway K — in 1971. That building, distinctive for its circular shape, still stands. Our Savior’s moved to its current home, just down the road, in 1999. Feb 7 1910 Germans and Danish separated. Nov. 1936 a choir was organized with several different directors over the years. Florence Behrend was organist. Ministries of Outreach, Welcome, & Music continue to be focus points of Our Savior’s Evangelical Lutheran Church; Meru Diocese Partnership, Tanzania, Africa; Family Promise; Hope Center; Loaves and Fishes; Appalachian Service Project; Disaster Relief Team. June 4, 2017 Lake Country Premier of Pastor Frank Janzow’s Jazz Liturgy, Rise Up! Bible Based, Saved By Grace, Serving with Jesus Everyplace! We are a congregation of the Greater Milwaukee Synod of the ELCA. There is a place for you here. Get all latest content delivered right to your email so you don't miss out! Thank you for visiting our online presence, we'd love to hear from your or see you in person!